It is fairly common to elicit language at Thanksgiving based on what we are thankful for. In this country, most of us have many things to be thankful for, and it is good to have a reminder to think about all of those things. It certainly is important to make sure that our students have the language to express gratefulness, as it is such an important skill for getting along! This year, my mind keeps wandering to the idea of gathering, another Thanksgiving theme. The Native Americans gathered enough food for a feast, and the Pilgrims gathered with them to celebrate, so our typical story goes. By tradition, families also gather on Thanksgiving to share the holiday and good food. Here are a few Thanksgiving related ideas. *Find out about your students’ Thanksgiving gatherings. Write a WH question word on each feather and have them give you that information before coloring the feathers. *Number each feather. Name a Thanksgiving item and they have to tell you that number of items that go with it. *Tell a Thanksgiving story. Students take turns providing a sentence. 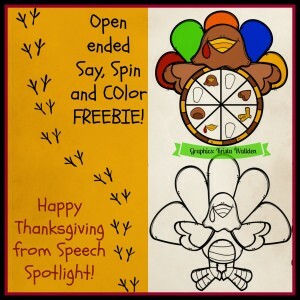 Then they can spin the spinner and start to color while the next student continues the story. See if they can finish coloring before they run out of story ideas. *Each student spins the spinner for the student after them. No peeking during the spin! Then the student has to give clues for the following student to guess what is to be colored. 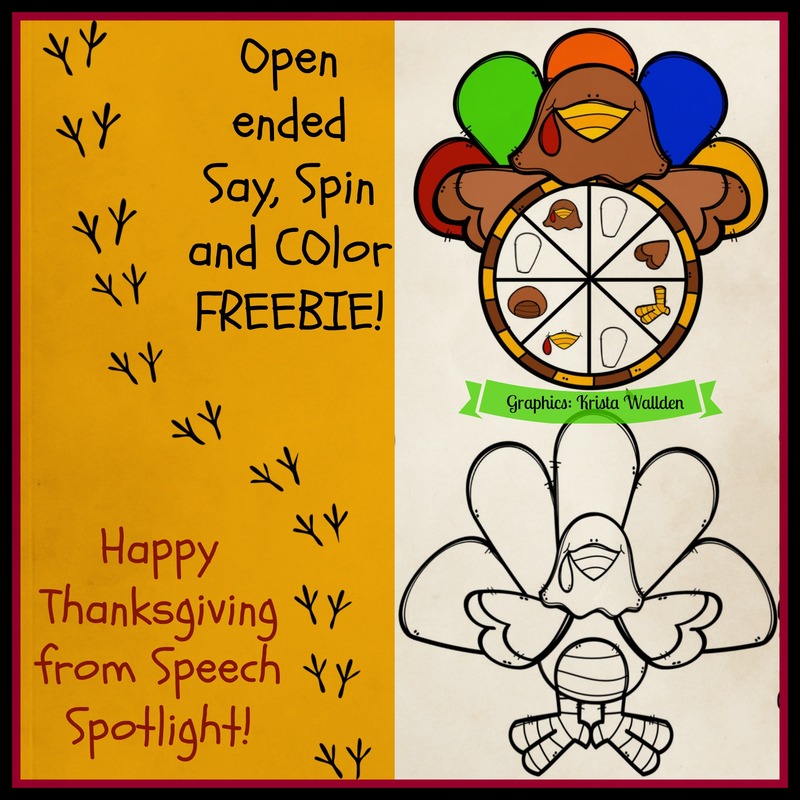 You can download the Thanksgiving freebie by clicking on the photo above. I hope you find it helpful!